List Rules Vote up the album artwork that is the most shocking. 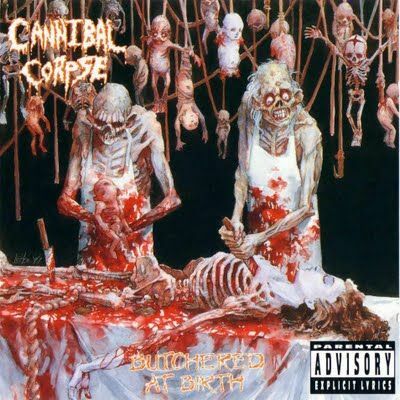 WARNING: This list contains explicit album covers and imagery, including some photos of real death and gore. NSFW, NSFL. View at your own risk. Numerous metal, grindcore, and gorecore bands—as well as less blatantly offensive acts like Guns N' Roses and America's British sweethearts, the Beatles—have issued controversial album covers that raised the ire of retailers, parent groups, Christian organizations, and even US politicians. Alongside dark and coarse lyrics, many of these album covers led to the application of the Parental Advisory label on the packaging, and many more were banned outright and replaced with generic artwork. In April 1991, Norwegian black metal band Mayhem lost their lead singer, nicknamed Dead, to suicide by shotgun blast to the head. When guitarist Euronymous discovered the body, he snapped a photo before calling the police. This photograph later become the cover of the Mayhem's 1995 live bootleg album Dawn of the Black Hearts. The cover for this 2000 release needs no explanation as to its controversial nature. The band, Last Days of Humanity, truly live up to their grindcore namesake. The title of this 1993 release roughly translates to "killing whitey," with most of the songs tackling this subject, as well as border crossing. Fittingly, the cover features an actual crime scene photo of a severed, light-skinned head, originally published in the crime and gore magazine ¡Alarma! US Senator and presidential candidate Bob Dole once accused Cannibal Corpse, among other groups, of "threatening the nation's character." That's a bit of a stretch, of course, but the band did feature some rather grotesque artwork on their albums, including this one from 1991. Germany outright banned the record, while retailers in Canada refused to sell Butchered at Birth to anyone under the age of 20.